A whole host of stars got into the spooky spirit this year, but who had the best Halloween costume? From the traditional, to the hilarious, to the just-plain-bizarre and the downright terrifying (yes, that’s you Mariah Carey), you can always count on our favourite A-listers to go all out for Halloween. Seal and Heidi Klum raised the bar this year as they celebrated the 10th anniversary of their annual Halloween bash by going all out in feathered finery, as scary his ‘n’ hers ravens. SEE ALL THE HALLOWEEN PICTURES HERE! Also attending the fancy dress party were a couple of Hiltons – with Paris Hilton in a predictable showgirl-meets-ballerina type ensemble, and showbiz blogger Perez Hilton turning up as Lady Gaga, complete with hair bow. Showing that they don’t take themselves too seriously, Kelly Osbourne and boyrfriend Luke Worrell also hit the LA bash dressed as rashers of bacon and a fried egg. Over in New York, our favourite Gossip girls and guys got into the spirit in decidedly un-traditional costumes – with an almost unrecognisable Blake Lively as an air hostess, Michelle Trachtenberg in an OTT period drama piece and Penn Badgely sporting hilarious 80s get-up. The White House was given a Halloween make-over, and the outside lit up with bright orange lights, as President Barrack Obama and Michelle Obama threw a children’s fancy dress party. 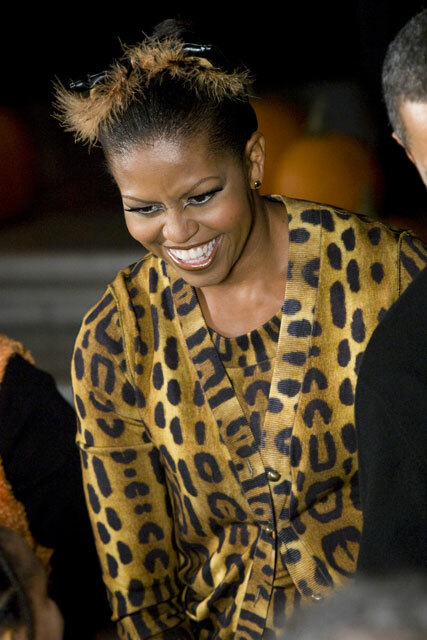 The ever-fashionable first lady helped keep the kids entertained in a leopard print cardigan, fluffy cat ears and fierce feline make-up. The London fash-pack were also out in force, with a ghoulish Pixie Geldof and her pal Henry Holland dressed as Edward Scissor-Hands, partying at the Browns Focus Halloween bash. Meanwhile, trick-or-treaters included a skeletal Christina Aguilera, Miley Cyrus greeted fans backstage at a gig in a Pocahontas-style costume, and it really was a fright-night thanks to Mariah Carey, who just scared us all silly in a ridiculous Angel ensemble. Who was your best dressed? Let us know in the comments box below!